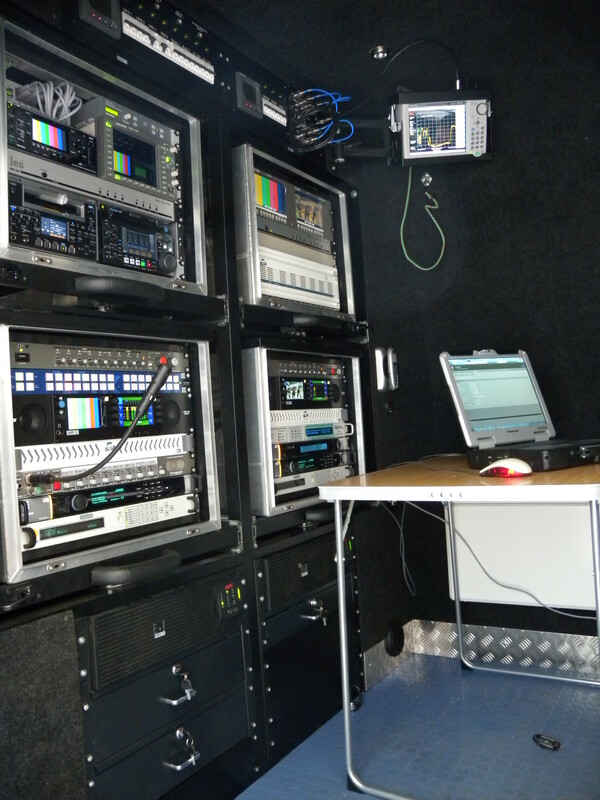 RTV RTC has started a new product line of mobile broadcasting reportage stations under its own brand. RTVS ("Reportage TV Station") is a new brand name of RTV RTC. RTVS-0312 - movable satellite communications station of Fly Away type - opens the new line. 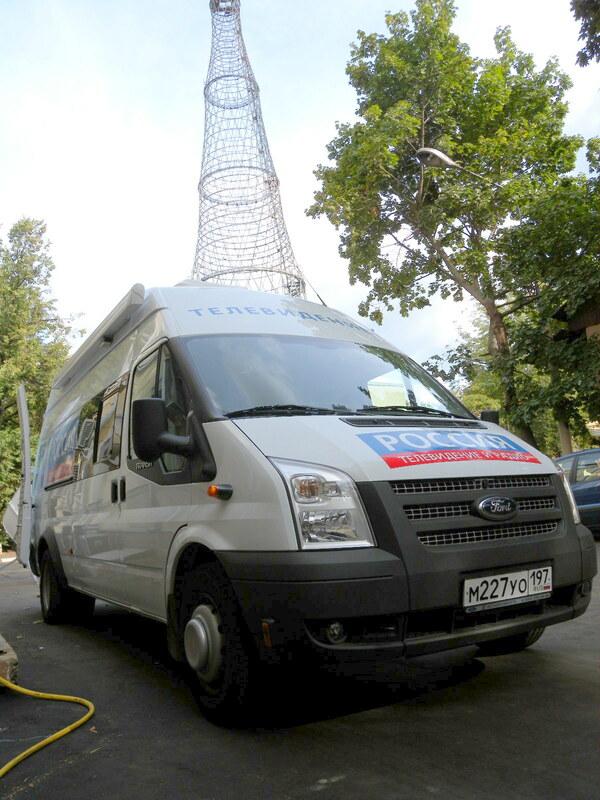 In September 2012, the RTV RTC company presented its new product – the DSNG station RTVS-0312 on the base of Ford Transit Jumbo , ordered by the Russian Television for APEC summit in Vladivostok. The vehicle was immediately sent to the shooting location, to Vladivostok, where it served for live stand-up transmissions of Russian Television. The station is a hybrid of a FlyAway and DriveAway system. According to the customer's wish, all the TV equipment was mount in shock-absorbing flight cases with ergonomical telescopic railings which help to put the cases into the van and take away. This way the station provides the possibility for the crew to work inside the vehicle, as a common DSNG van, and adds opportunity for safe transportation of equipment without the van, by plane, helicopter or even small river boat. ERA/Cobham 12Ku antenna with 4-segment reflector was chosen for the station because of remarkable RF characteristics and excellent ergonomics. A new generation of solid state amplifiers based on GaN technology from Advantech Wireless with nominal output 160W was chosen because of outstanding ratio of Watt output to amlifier weight and low mains consumption. Redundant system of 1:1 of such HPA was used and has shown simple but robust behavior. 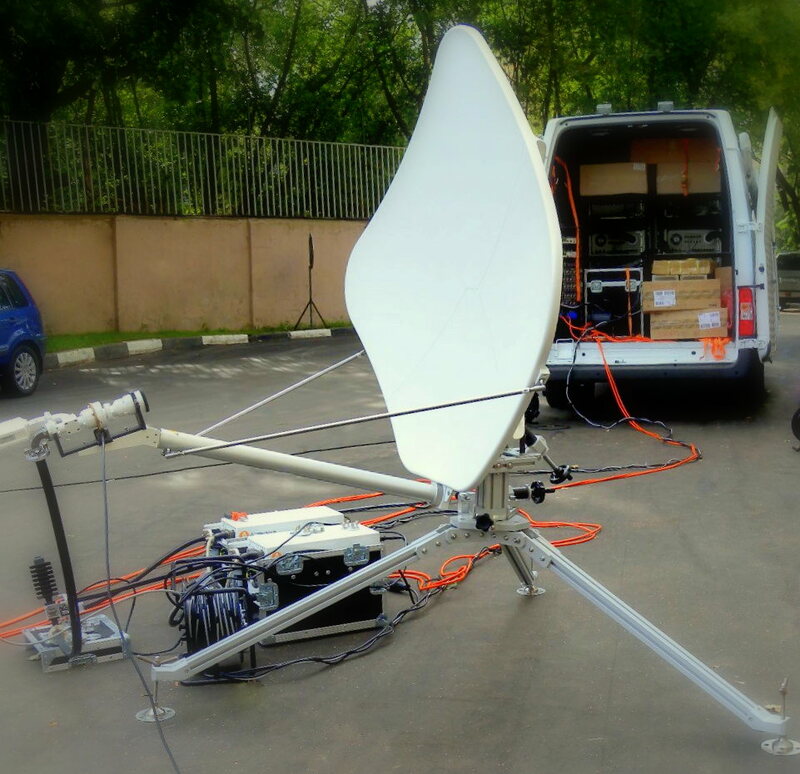 The channel equipment is represented by Ericsson's DSNG-coders of last modification which operate in DVB-S/S2 up to 16APSK, from 576i to 1080 with 4:2:2 chroma processing in MPEG 4 HD also. The station can simultaneously transmit two TV programs each on its separate carrier. To control the transmitted signals and receive a "reverse image" the station is equipped with an Ericsson TV decoding receiver (DVB-S/S2 upto 16APSK, MPEG-2/4 HD/SD 4:2:2/4:2:0), which supports standard and high definition. The control equipment includes high-resolution Anritsu spectrum analyzer, video and sound Wohler monitors and Tektronix oscilloscope. In addition, the station configuration includes SONY video recorders and camcorders, field mixer and analog audio program mixer. In the addition, the vehicle is equipped with a satellite navigation, a heating compartment and rooftop air conditioning by Dometic, which provides comfortable conditions for the normal operation of the equipment and personnel of the station in any weather. The station has been certified in the "Svyaz" system (The Ministry of Communications). - The experts working in our company has an experience of the building of about a few dozens different SNG and ENG stations of different configurations and purposes, - says Mr. Lopanov, the General Director of RTV RTC. - I am convinced that RTVS-0312 is the first if row of many stations of the new brand which we will build in the nearest future.